U.S. 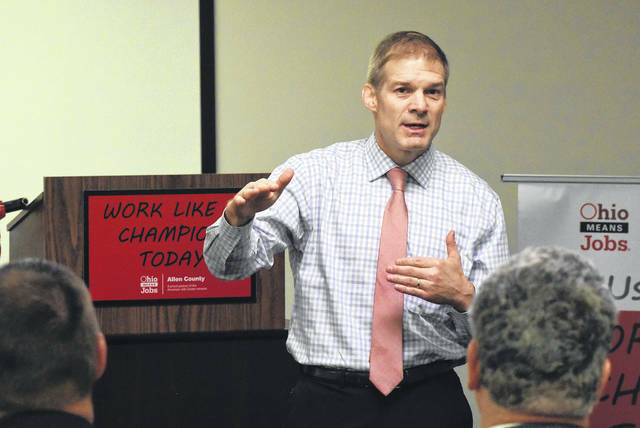 Congressman Jim Jordan, addresses Allen County Job & Family Services during a news conference on Friday morning on new employment incentives programs aimed at assisting Job and Family Services clientele. Joe Patton, director of Allen County Job & Family Services, speaks at a news conference on Friday morning on new employment incentives programs aimed at assisting Job and Family Services clientele. 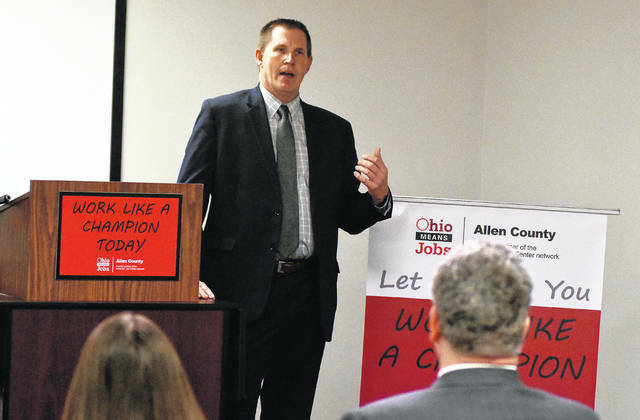 LIMA — OhioMeansJobs of Allen County has officially introduced a pilot program meant to lessen the impact of the “benefit cliff” individuals may experience when they become eligible for pay raises or job opportunities. Created by the Allen County Department of Job and Family Services with collaboration by State Rep. Bob Cupp and State Sen. Matt Huffman, the program provides an additional $2,500 over a 18-month period to those enrolled in the Prevention, Retention and Contingency Program. The pilot program’s goal is to derail the incentive to stay on public assistance when workers approach the income threshold for state benefits. ACDJFS Director Joe Patton said feedback from the business community has shown when an employer wishes to reward a raise, some employees may resist because the increase in wages would take away state-provided food stamps and other benefit assistance. In response to the issue, the pilot program would make $2,500 available over an 18-month period to anyone earning over the nationally-defined income threshold but below $16 per hour for a three-person household. The fund could only be accessed in case of a financial emergency that PRC program funds could not cover. Those in the program will also be assigned a job coach who will provide financial information, such as budgeting guidance, to program participants. Individuals who qualify for the program already must be TANF-eligible, have income below 200 percent of the federal poverty level, work full-time for less than $16 per hour, have a child and is already being helped by an OhioMeansJobs Program. Roughly 5,600 households in Allen County are currently receiving public assistance. The program was rolled out during a ceremony attended by Huffman, Cupp and Rep. Jim Jordan. “I’re really excited to see where this takes us us five to 10 years from now,” Allen Economic Development Group President/CEO Jeff Sprague said. Allen/Lima Chamber of Commerce President Jed Metzger said he has heard from many business owners looking to change how the state’s income threshold for benefits impacted their employees. He said adding this pilot program will help people become self-sufficient to the point they won’t have to rely on the state’s benefits system. The pilot program will run until it helps roughly 100 individuals, and it will then be reviewed to gauge its effectiveness. The cost is estimated to be $4,500 per program participant, Patton said. Anyone interested in applying or learning more about the program are encouraged to call 419-999-0332.